This article is about a contemporary era Buddhist tradition. For book publisher, see Navayana (publishing house). Navayana (Devanagari: नवयान, IAST: Navayāna) means "new vehicle" and refers to the re-interpretation of Buddhism by B. R. Ambedkar. Ambedkar was born in a Dalit (untouchable) family during the colonial era of India, studied abroad, became a Dalit leader, and announced in 1935 his intent to convert from Hinduism to Buddhism. Thereafter Ambedkar studied texts of Buddhism, found several of its core beliefs and doctrines such as Four Noble Truths and "non-self" as flawed and pessimistic, re-interpreted these into what he called "new vehicle" of Buddhism. This is known as Navayana, also known as Bhimayāna after Ambedkar's first name Bhimrao. Ambedkar held a press conference on October 13, 1956, announcing his rejection of Theravada and Mahayana vehicles, as well as of Hinduism. Thereafter, he left Hinduism and adopted Navayana, about six weeks before his death. In the Dalit Buddhist movement of India, Navayana is considered a new branch of Buddhism, different from the traditionally recognized branches of Theravada, Mahayana and Vajrayana. Navayana rejects practices and precepts such as renouncing monk and monasticism, karma, rebirth in afterlife, samsara, meditation, enlightenment and Four Noble Truths considered to be foundational in the Buddhist traditions. It radically re-interprets what Buddhism is, revises the original Buddha teaching to be about class struggle and social equality. Ambedkar called his version of Buddhism Navayana or Neo-Buddhism. His book, The Buddha and His Dhamma is the holy book of Navayana followers. Ambedkar was a Dalit leader, influential during the colonial era and post-independence period of India. He was the fourteenth child in an impoverished Maharashtra Dalit family, who studied abroad, returned to India in the 1920s and joined the political movement. His focus was social and political rights of the Dalits. To free his community from religious prejudice, he concluded that they must leave Hinduism and convert to another religion. He considered Islam, Christianity, Sikhism and Buddhism. He chose Buddhism in the form of Navayana. The Buddhist tradition believes that the Buddha one day saw a sick man, an old man and a dead body in sequence, then he left his princely life and sought insights and a way out of human suffering. According to Ambedkar, this was absurd. He proposed that the Buddha likely sought insights because he was involved in "making peace among tribes". Ambedkar believed that this core doctrine of Buddhism was flawed because it denied hope to human beings. According to Ambedkar, the Four Noble Truths is a "gospel of pessimism", and may have been inserted into the Buddhist scriptures by wrong headed Buddhist monks of a later era. These should not be considered as Buddha's teachings in Ambedkar's view. These are other core doctrines of Buddhism. Anatta relates to no-self (no soul) concept. Ambedkar believed that there is an inherent contradiction between the three concepts, either Anatta is incorrect or there cannot be Karma and Rebirth with Anatta in Ambedkar's view. Other foundational concepts of Buddhism such as Karma and Rebirth were considered by Ambedkar as superstitions. A Bhikshu is a member of the monastic practice, a major historic tradition in all schools of Buddhism. According to Ambedkar, this was a flawed idea and practice. He questioned whether a Bhikshu tradition was an attempt to create "a perfect man or a social servant", states Zelliot. According to Navayana, nirvana is not some other-worldly state of perfect quietude, freedom, highest happiness, nor soteriological release and liberation from rebirths in saṃsāra. In Ambedkar's view, nirvana is socio-political "kingdom of righteousness on earth" in which people are "freed from poverty and social discrimination and empowered to create themselves happy lives", state Damien Keown and Charles Prebish. 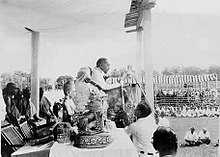 Ambedkar delivering speech during mass conversion in Nagpur, 14 October 1956. Ambedkar re-interpreted Buddhism to address such issues in his mind, and re-formulated the traditional teachings of Buddhism into a "new vehicle" called Navayana. Navayana dhamma doctrine as propounded by Ambedkar, states Yashwant Sumant, "does not situate morality in a transcendental [religious] domain", nor in "a civil association, including the state". Dhamma is derived from and the guiding principle for social conscience. I will accept and follow the teachings of Buddha. I will keep my people away from the different opinions of Hinayana and Mahayana, two religious orders. Our Buddhism is a Neo-Buddhism, Navayana. 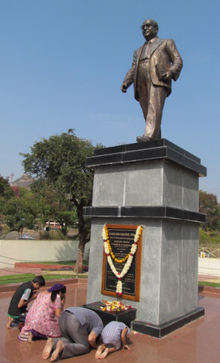 People paying tribute at the statue of Babasaheb Ambedkar. The writings of Ambedkar were posthumously published as The Buddha and His Dhamma, and this is the scripture for those who follow Navayana Buddhism. Among the Navayana followers, states Keown and Prebish, this is "often referred to as their 'bible' and its novel interpretation of the Buddhist path commonly constitutes their only source of knowledge on the subject. In this scripture of the Navayana tradition, there are no doctrines of renunciation and monastic life, or karma, or rebirth, or jhana (meditation), or nirvana, or realms of existence or Four Noble Truths – ideas found in the major traditions of Buddhism. The text presents the Buddha as teaching a social empowerment framework. Ambedkar's text on Navayana states that this was what the true Buddha taught and which escapist Buddhist monks had distorted, through misguided interpolations, over Buddhism's long history. B. R. Ambedkar is regarded as a Bodhisattva, the Maitreya, among the Navayana followers. In practice, the Navayana followers revere Ambedkar, states Jim Deitrick, as virtually on par with the Buddha. He is considered as the one prophesied to appear and teach the dhamma after it was forgotten; his iconography is a part of Navayana shrines and he is shown with a halo. Though Ambedkar states Navayana to be atheist, Navayana viharas and shrines features images of the Buddha and Ambedkar, and the followers bow and offer prayers before them in practice. According to Junghare, for the followers of Navayana, Ambedkar has become a deity and is devotionally worshipped. Ambedkar understands the Buddha's teaching that everything is characterized by Dukkha, or unsatisfactoriness, as referring specifically to interpersonal relations. In one instance Ambedkar presents a dialogue in which the Buddha teaches that the root of dukkha is class conflict and asserts elsewhere that "the Buddha's conception of Dukkha is material." Nibbana (Skt. nirvana) the state or process which describes enlightenment, is considered [by Ambedkar] a precursor for moral action in the world and explicitly associated with a non-monastic lifestyle. Nibbana "means enough control over passion so as to enable one to walk on the path of righteousness." Ambedkar's interpretation of dukkha and nibbana implies that moral action, for which nibbana is preparation, will rectify the material suffering of inequality. Ambedkar considered all ideas in Theravada and Mahayana Buddhism that relate to an individual's merit and spiritual development as insertions into Buddhism, and something that "cannot be accepted to be the word of the Buddha". Buddhism, to Ambedkar, must have been a social reform movement. Martin Fuchs states that Ambedkar's effort is to be admired as an attempt to seek a "post-religious religion" which transcends distinctions and as being driven by the "reasonable principle of sociality", not in the sense of spiritual doctrines, philosophical speculations and existentialist questions. According to Blackburn, "neither view of traditional Buddhism — as a social reform movement or as some other stable entity interpreted (or misinterpreted) from a social reform perspective — is historically accurate", thereby placing Navayana theories to be ahistorical though it served as an important means to Dalit political mobilization and social movement. Scholars broadly accept that the depictions of the Buddha as a caste or social reformer are inaccurate. Richard Gombrich, an Indologist and a professor of Buddhist Studies, states that there is no evidence that the Buddha began or pursued social reforms or was against a caste system, rather his aim was at the salvation of those who joined his monastic order. Modernist interpreters of Buddhism, states Gombrich, keep picking up this "mistake from western authors", a view that initially came into vogue during the colonial era. Empirical evidence outside of India, such as in the Theravada Buddhist monasteries of the Sinhalese society, suggests that caste ideas have been prevalent among the sangha monks, and between the Buddhist monks and the laity. In all canonical Buddhist texts, the kshatriyas (warrior caste) are always mentioned first and never other classes such as brahmins, vaishyas, shudras or the untouchables. The novel interpretations and the dismissal of mainstream doctrines of Buddhism by Ambedkar as he formulated Navayana has led some to suggest that Navayana may more properly be called Ambedkarism. However, Ambedkar did not consider himself as the originator of a new Buddhism, but stated that he was merely reviving what was original Buddhism after centuries of "misguided interpretation" by wrong headed Buddhist monks. Others, states Skaria, consider Ambedkar attempting a synthesis of the ideas of modern Karl Marx into the structure of ideas by the ancient Buddha, as Ambedkar worked on essays on both in the final years of his life. According to Janet Contursi, Ambedkar re-interprets Buddhist religion and with Navayana "speaks through Gautama and politicizes the Buddha philosophy as he theologizes his own political views". According to the 2011 Census of India there are 8.4 million Buddhists in India. Navayana Buddhists comprise about 87% (7.3 million) of Indian Buddhist community, and nearly 90% (6.5 million) of all Navayana Buddhists in India live in Maharashtra state. 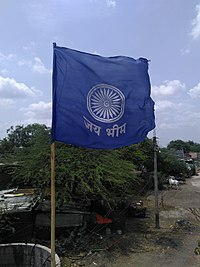 Dalits with economic prosperity are Buddhists, and in general states an IndiaSpend.com report "Buddhists have a literacy rate of 81.29%, higher than the national average of 72.98%, according to Census data." However, when compared to overall literacy rate of Maharashtra state where 80% of Buddhists are found, their literacy rate is 83.17% or slightly higher than statewide average of 82.34%. According to Jean Darian, the conversion to Buddhism and its growth in India has in part been because of non-religious factors, in particular the political and economic needs of the community as well as the needs of the political leaders and the expanding administrative structure in India. According to Trevor Ling and Steven Axelrod, the intellectual and political side of Navayana Buddhist movement lost traction after the death of Ambedkar. ^ a b c Gary Tartakov (2003). Rowena Robinson (ed.). Religious Conversion in India: Modes, Motivations, and Meanings. Oxford University Press. pp. 192–213. ISBN 978-0-19-566329-7. ^ Christopher Queen (2015). Steven M. Emmanuel (ed.). A Companion to Buddhist Philosophy. John Wiley & Sons. pp. 524–525. ISBN 978-1-119-14466-3. ^ a b Nicholas B. Dirks (2011). Castes of Mind: Colonialism and the Making of Modern India. Princeton University Press. pp. 267–274. ISBN 1-4008-4094-5. ^ a b c d e f g h i j Eleanor Zelliot (2015). Knut A. Jacobsen (ed.). Routledge Handbook of Contemporary India. Taylor & Francis. pp. 13, 361–370. ISBN 978-1-317-40357-9. ^ a b c Christopher Queen (2015). Steven M. Emmanuel (ed.). A Companion to Buddhist Philosophy. John Wiley & Sons. pp. 524–529. ISBN 978-1-119-14466-3. ^ Skaria, A (2015). "Ambedkar, Marx and the Buddhist Question". Journal of South Asian Studies. Taylor & Francis. 38 (3): 450–452. doi:10.1080/00856401.2015.1049726. , Quote: "Here [Navayana Buddhism] there is not only a criticism of religion (most of all, Hinduism, but also prior traditions of Buddhism), but also of secularism, and that criticism is articulated moreover as a religion." ^ Damien Keown; Charles S. Prebish (2013). Encyclopedia of Buddhism. Routledge. p. 25. ISBN 978-1-136-98588-1. , Quote: "(...)The Buddhism upon which he settled and about which he wrote in The Buddha and His Dhamma was, in many respects, unlike any form of Buddhism that had hitherto arisen within the tradition. Gone, for instance, were the doctrines of karma and rebirth, the traditional emphasis on renunciation of the world, the practice of meditation, and the experience of enlightenment. Gone too were any teachings that implied the existence of a trans-empirical realm (...). Most jarring, perhaps, especially among more traditional Buddhists, was the absence of the Four Noble Truths, which Ambedkar regarded as the invention of wrong-headed monks". ^ Bruce Rich (2008). To Uphold the World. Penguin Books. p. 204. ISBN 978-0-670-99946-0. , Quote: Ambedkar's interpretation of Buddhism was a radical one; it took a revisionist approach to a number of widely accepted traditional Buddhist teachings". ^ a b c d e f g h i j k Damien Keown; Charles S. Prebish (2013). Encyclopedia of Buddhism. Routledge. pp. 24–26. ISBN 978-1-136-98588-1. ^ Christopher S. Queen (2000). Engaged Buddhism in the West. Wisdom Publications. p. 23. ISBN 978-0-86171-159-8. ^ Christopher Queen (2015). Steven M. Emmanuel (ed.). A Companion to Buddhist Philosophy. John Wiley & Sons. pp. 524–531. ISBN 978-1-119-14466-3. ^ a b c Robert E. Buswell Jr.; Donald S. Lopez Jr. (2013). The Princeton Dictionary of Buddhism. Princeton University Press. p. 34. ISBN 978-1-4008-4805-8. ^ Yashwant Sumant (2004). Surendra Jondhale; Johannes Beltz (eds.). Reconstructing the World: B.R. Ambedkar and Buddhism in India. Oxford University Press. pp. 74–75. ISBN 978-0-19-566529-1. ^ Christopher Queen (2015). Steven M. Emmanuel (ed.). A Companion to Buddhist Philosophy. John Wiley & Sons. pp. 529–531. ISBN 978-1-119-14466-3. ^ Fitzgerald, Timothy (2003). The Ideology of Religious Studies. Oxford University Press. p. 129. ISBN 978-0-19-534715-9. ^ a b M.B. Bose (2017). Tereza Kuldova and Mathew A. Varghese (ed.). Urban Utopias: Excess and Expulsion in Neoliberal South Asia. Springer. pp. 144–146. ISBN 978-3-319-47623-0. ^ Jim Deitrick (2013). Damien Keown and Charles S. Prebish (ed.). Encyclopedia of Buddhism. Routledge. p. 25. ISBN 978-1-136-98588-1. ^ Rowena Robinson (2003). Religious Conversion in India: Modes, Motivations, and Meanings. Oxford University Press. p. 2009. ISBN 978-0-19-566329-7. ^ I.Y. Junghare (1988), Dr. Ambedkar: The Hero of the Mahars, Ex-Untouchables of India, Asian Folklore Studies, Vol. 47, No. 1, (1988), pp. 93–121, "(...) the new literature of the Mahars and their making of the Ambedkar deity for their new religion, Neo-Buddhism. (...) Song five is clearly representative of the Mahar community's respect and devotion for Ambedkar. He has become their God and they worship him as the singer sings: "We worship Bhima, too." (...) In the last song, Dr. Ambedkar is raised from a deity to a supreme deity. He is omnipresent, omnipotent, and omniscient." ^ Y. Krishan (1986), Buddhism and the Caste System, The Journal of the International Association of Buddhist Studies 9 (1), 71–84, Quote: "It has been long recognised that Buddhism and Jainism were not movements for social reform directed against the caste system, and that the Buddha's doctrine did not aim at transformation or improvement of the social conditions." ^ a b Richard Gombrich (2012). Buddhist Precept & Practice. Routledge. pp. 344–345, context and discussion: 343–370. ISBN 978-1-136-15623-6. ^ Christopher S. Queen; Sallie B. King (1996). Engaged Buddhism: Buddhist Liberation Movements in Asia. State University of New York Press. pp. 17–18. ISBN 978-0-7914-2844-3. ^ Wanda Alberts (2007). Integrative Religious Education in Europe: A Study-of-Religions Approach. Walter de Gruyter. pp. 258–259. ISBN 978-3-11-097134-7. ^ Donald S. Lopez Jr. (2009). Buddhism and Science: A Guide for the Perplexed. University of Chicago Press. pp. 84–91. ISBN 978-0-226-49324-4. ^ Richard Gombrich (2012). Buddhist Precept & Practice. Routledge. pp. 343–366. ISBN 978-1-136-15623-6. ^ Skaria, A. (2015). "Ambedkar, Marx and the Buddhist Question". Journal of South Asian Studies. Taylor & Francis. 38 (3): 450–465. doi:10.1080/00856401.2015.1049726. ^ Contursi, Janet A. (1993). "Political Theology: Text and Practice in a Dalit Panther Community". The Journal of Asian Studies. Cambridge University Press. 52 (2): 320–339. doi:10.2307/2059650. ^ a b c Moudgil, Manu. "Conversion To Buddhism Has Brought Literacy, Gender Equality And Well-Being To Dalits – IndiaSpend-Journalism India -Data Journalism India-Investigative Journalism-IndiaSpend". www.indiaspend.com. ^ "Dalits Are Still Converting to Buddhism, but at a Dwindling Rate". ^ Darian, Jean C. (1977). "Social and Economic Factors in the Rise of Buddhism". Sociological Analysis. Oxford University Press. 38 (3): 226–231. doi:10.2307/3709803. ^ Trevor Ling; Steven Axelrod (1980). Buddhist Revival in India: Aspects of the Sociology of Buddhism. Palgrave Macmillan. pp. 49–51. ISBN 978-1-349-16310-6. Ambedkar, BR (1950). "Buddha and the Future of His Religion". The Mahä-Bodhi. 58 (4–5): 117–118, 199–206. Wikimedia Commons has media related to Navayana. Byung-Jo Chung, "Navayāna Buddhism: A Fresh Direction for Buddhism to Reflect the New Millenium", International Journal of Buddhist Thought & Culture, (September 2003, Vol. 3). This page was last edited on 15 February 2019, at 18:07 (UTC).